Showing edge view. Pitsford Water, Nothampton Uk. 20 Jun 2017. © C.F.Carter (chris.Carter'at'6cvw.freeuk.com. Colony Reservoir, Leicester, UK. 20 Apr 2017. © C.F.Carter (chris.Carter'at'6cvw.freeuk.com. Castle Ashby Gardens Northants, UK. BF image.. 12 Nov 2014. © C.F. Carter(chris.carter'at'6cvw.freeuk.com. Bainbridge Island, Washington, USA; golf course, 400x, DIC. 11 May 2008. Karl Bruun. © Karl Bruun (skogenman@earthlink.net). Bainbridge Island, Washington, USA; golf course, 1000x, DIC. 05 Apr 2008. Karl Bruun. © Karl Bruun (skogenman@earthlink.net). Pediastrum duplex Meyen Castle Ashby Park, Northamptonshire, UK. BF image. Published in: Meyen, F.J.F. (1829). Beobachtungen über einige niedere Algenformen. Nova Acta Physico-Medica Academiae Caesareae Leopoldino-Carolinae Naturae 14: 768-778, pl. XLIII . 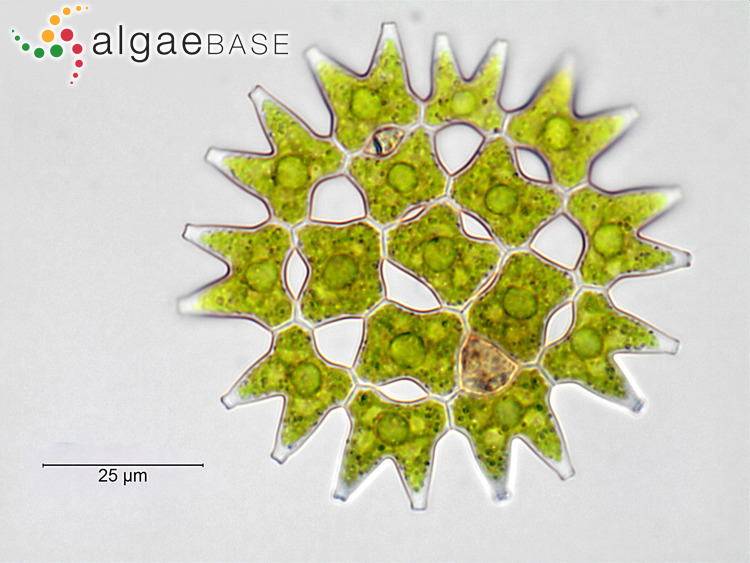 This is the type species (lectotype) of the genus Pediastrum. Garduño-Solórzano, G.,Guillén-Ruiz, D.L., Martínez-García, M., Quintanar-Zuñiga, R.E., Campos, J.E. & Comas-González, A.A. (2016). Pediastrum sensu lato (Chlorophyceae) of central Mexico. Cryptogamie Algologie 37(4): 273-295. McManus, H.A. & Lewis, L.A. (2005). Molecular phylogenetics, morphological variation and colony-form evolution in the family Hydrodictyaceae (Sphaeropleales, Chlorophyta). Phycologia 44: 582-595. Accesses: This record has been accessed by users 14671 times since it was created. Lehman, J.T. (1976). 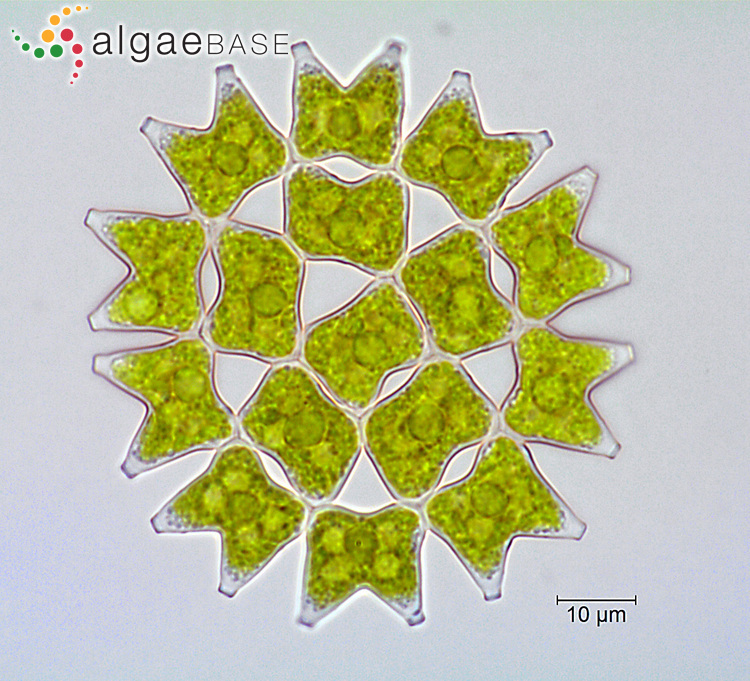 Photosynthetic capacity and luxury uptake of carbon during phosphate limitation in Pediastrum duplex (Chlorophyceae). Journal of Phycology 12: 190-193, 3 figs, 1 table. McManus, H.A. Lewis, L.A. & Schultz, E.T. (2011). 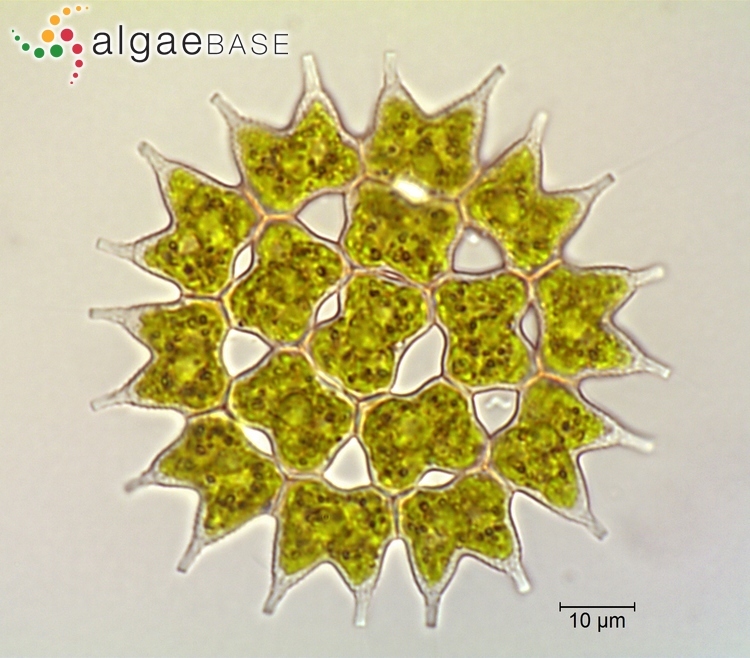 Distinguishing multiple lineages of Pediastrum duplex with morphometrics and a proposal for Lacunastrum gen. nov. Journal of Phycology 47(1): 123-130. Sigee, D.C., Dean, A., Levado, E. & Tobin, M.J. (2002). 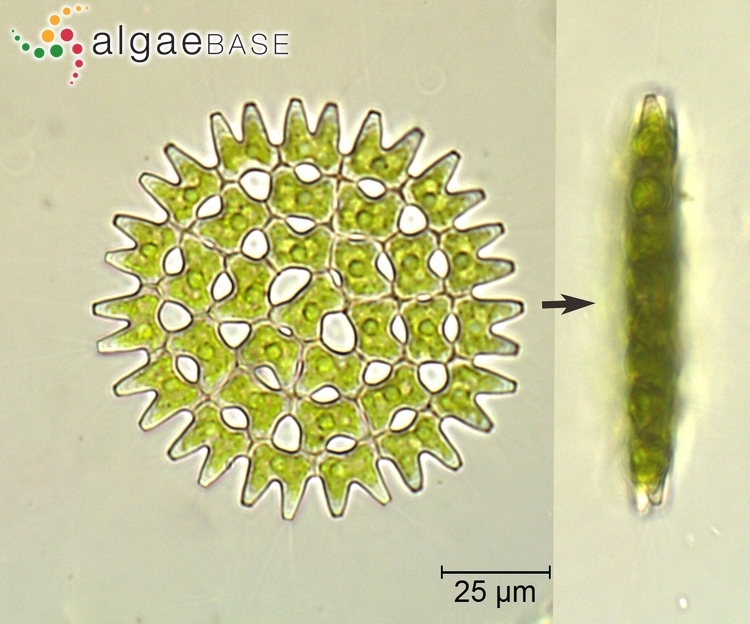 Fourier-transform infrered spectroscopy of Pediastrum duplex: characterization of micro-population isolated from a eutrophic lake. European Journal of Phycology 37: 19-26. Smoliner, C. (1983). 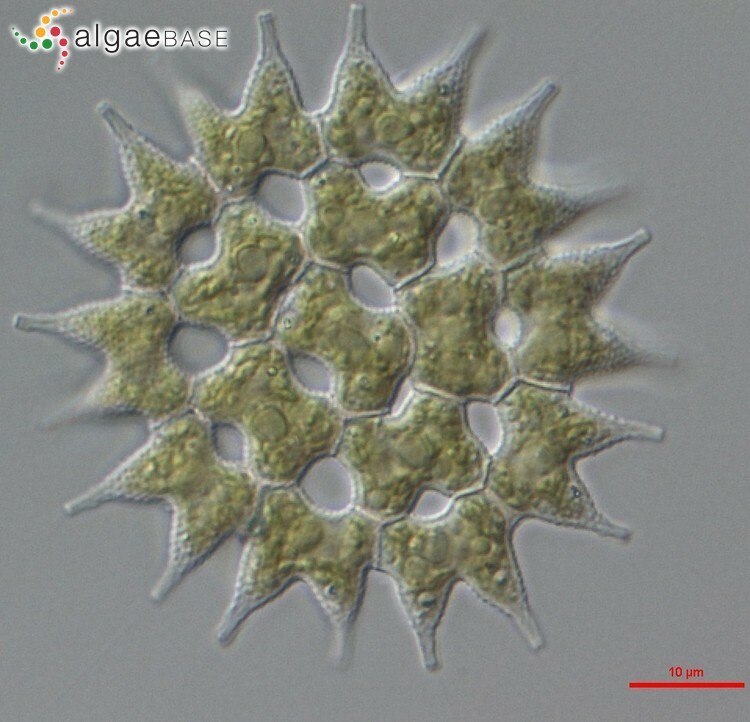 Das zähe leben der grünalge Pediastrum duplex. Mikrokosmos 8: 241-245. Wilcox, L.W. & Floyd, G.L. (1988). 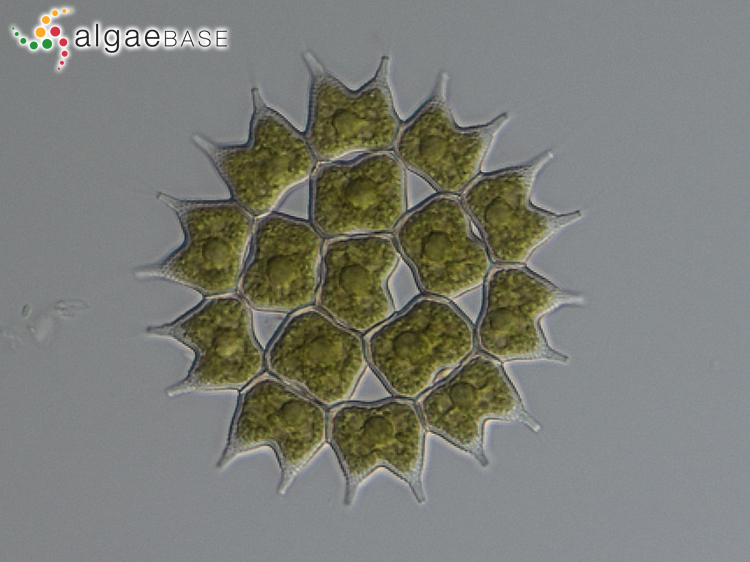 Ultrastructure of the gamete of Pediastrum duplex (Chlorophyceae). Journal of Phycology 24: 140-146.